Image Source: WeHeartIt.com . If the original image belongs to you please let me know and I'll remove/credit as appropriate. 2. Clocks going forwards. Sadly we will lose an hour of precious sleep time but it will mean that it should be a bit lighter in the evenings. I've been loving leaving work while it's still light outside so more of this please! 3. Slightly warmer and less wet weather? Maybe? I am itching to transition back into ballet pumps and lighter coats/jackets. 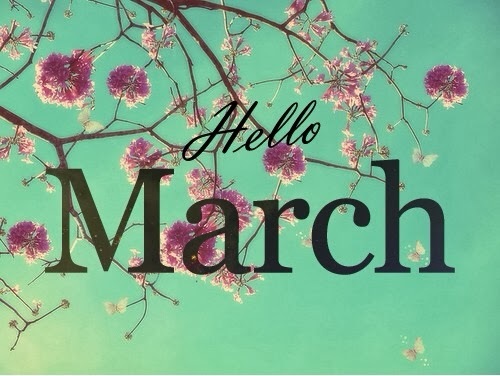 Might be a bit optimistic for March though. 4. Hoping to kick my bum into gear with some some more exercise, particularly running. I've ordered some new workout clothes and bits and am feeling really positive about it. I just need to turn that positivity into actual movement! I live in a village with zero streetlights around and my running route is through the fields and woods - this does not make for a winter friendly run as I get a little spooked running through the woods even when it's light. The lighter evenings (fingers crossed that's soon) will hopefully help with this. Couch25K, I'm coming for you! I'm also tempted to buy Davina McCall's 'Fit in 15' DVD as I like how it's broken down into short concentrated easy chunks that you can bundle together for longer workouts too, and mix up cardio and strength. Does anyone have this DVD and is ti any good? I've never tried her workout DVDs before but I know they're pretty popular and I do really like Davina, so I have high hopes. 6. Hopefully a nice weekend away for me and Mark, because we could both do with a bit of a break and spending some time together. 1. Mumma bear and I painted out nails in matching proper paint box red :) Looks so classy..until it chips. 2. I picked up my new specs and despite some reservations when I chose them the week before, I absolutely love them! Can;t believe how much of a difference it made getting the clearer/cosmetic lenses put in instead too. I got prescription aviator sunnies as my free pair, so I will finally be able to see when I'm driving and it's sunny, rather than just squinting. Hurrah. 3. This was the view from my office window on a grey London day last week. Thankfully we've had a bit of sunshine since then. I am in need of a dose of Vitamin D! 4. I've been trying to take my lunch into work every day but it doesn't always work out that way. This my favourite Pret combo though. 5. This little pile of make-up graced my face one day last week after I had a nightmare of an evening and realised I'd left my glasses in my office at work. But obviously didn't realise until I'd taken the train out of London and got back to my car. I can't drive without them so couldn't get myself home and was kind of stranded at a friend's. I stayed with my boyfriend but had nothing at all with me so my friend lent me a few bits to make myself slightly more presentable for work the next day. It was actually kind of liberating not having all my usual stuff with me. Although i won't make a habit of it! Lesson for the future = keep a spare pair of glasses in my car. 6. It was my mum's birthday last week, and hopefully she had a lovely day :) I cooked in the evening and then did the obligatory cake, candles and singing affair. We didn't want a big cake that wasn't going to get eaten though, so I bought this little chocolate brownie bake instead. Yum. 7. Polished this book off on my commutes last week. I love Tess Gerritsen but this was not her best. 8. Saturday I spent a lovely day wandering around Oxford St and Regent St with friends. Although I felt like I was doing my commute when we were on the train, it was actually nice spending some time in London for non-work purposes and perusing the shops which I normally avoid like the plague. We started at Joe and the Juice (good juice!) and ended with late lunch/early dinner at Jack & Rye in Soho. Have the buttermilk fried chicken. It's amazing. 9. And then on Saturday evening I made it back to my home town to spend some time with my boyfriend. Take away food and weekend tv. Perfect. You also get a glimpse of my new bright pink jumper I got in the H&M sale the week before. I'm not really a 'pink' person, but if I wear it then it has to be bright, and I love this. 1. I dug this unloved dress out of my wardrobe for work and decided if I wore it and didn't like it then it could go straight to the charity shop. But I actually quite liked it with the shirt underneath. 2. Waiting for the train home. I feel like I spend half my working week on or waiting for trains! 3. Cosy clothes at home after a pants day at work. 5. I had a yummy chinese takeaway with friends in the week and caught up on trashy tv (Dinner Date anyone?). Despite eating a LOT of Chinese food we managed to squeeze in these profiteroles for puds. Unnecessary but good. 6. Mark and I popped to Cambridge on Saturday for a spot of boy clothes shopping. I love boy shopping as it involves all the fun with none of the expenditure (well, on my part anyway!). We then went to Byron for a lunch of yummy burgers. I love their courgette fries. I've never had room for a milkshake though, are they good? 7. Despite being on a boy shopping mission |I did manage to try on a couple of bits in H&M. The sale items were buy one get one free and, although I usually avoid their sale rails, I did have a quick look. I love the colour of this shirt and almost left it behind as it was a big too big in the chest area but it was the only one and I liked it too much so for £4 I had to get it. Tucked away for some springtime sunshine...when it appears. 8. As you can see I also bought a couple of bits in Boots and stocked up on some good quality pants from M&S! In contrast to my student days, I haven't been in Primark in aaages recently. The striped t-shirt is just adding to my ever-expanding stripey top collection. I definitely didn't need it but it called to me from across the shop. And when asked, Mark said 'yeah that's nice, and you do love your stripey tops'. All the encouragement I needed. Semi-hideous maxi skirt. I needed a long skirt for my trip, this was £1 on the sale rail and there were no others. Decision made. It does not look good on though so may be one for the donation bag. The black bag I actually really like but just picked up as an easy and cheap across-the-body bag for my trip. Then there are some basics: a sports bra, slipper socks and ballet pumps. All cheapy necessities. Some travel size Simple face bits for hand luggage-friendly travel. Finally I bought some fit bands as I had seen them on a fitness blog just the day before, so when I saw them in the shop I couldn't resist. I have no idea what I'm actually going to do with them though. Anyone actually use fit bands, and if so, what for?! I think this all came to £26. Can't say fairer than that! Has anyone found any gems in Primark recently? Should I persevere or do you just find toot as well? 1. This is another one of my January sales bits (New Look) and I’ve loved it for work recently. A bit more interesting than a plain top because of the appliqué flowers, but not too cute and girly floral. 2. I’ve been wanting to improve my French recently because even though it was half of my univerdity degree, it really isn’t up to scratch. Bit embarrassing really. So I bought these in the hope they’d be what I needed to remind me of structures, grammar etc and to practice. And so far I think they’re fab! Exceeded my expectations for sure. Would be interested to try this method as a beginner and see how it worked. As an aside these CDs took forEVER to arrive (cheers for less-than-fantastic customer service Groupon). 3. Spending my lunch break with San Pellegrino and Stylist mag (which I’m sure they’ve made smaller – have they?). I did have food too, obviously. 4. On Sunday we went to Strada for lunch, and it was the first time I had ever been. My pasta was absolutely delicious, but having looked at the rest of the menu I think I probably prefer Prezzo overall. 6. Cracking out the Taylor Swift top I bought at her concert the week before. I want to go back and watch it again! 7. I went for lunch with my dad and step-mum in Cambridge on Saturday which was nice as I hadn’t seen them since November. 8. I then met up with some friends in a cute tea shop/cafe in my local town. You can’t beat a catch up with your closest friends. The Perfect Breton Striped Top? I love a good stripey top and an increasing amount of my wardrobe space is taken up with stripes of varying colour and size. Finding the perfect striped top is a never-ending quest though. They're always too fitted or too thick or way too baggy, or the stripes aren't quite right. I spotted a couple of contenders last week though whilst doing a bit of browsing on my way to work and when I was waiting to meet some friends for tea. Both were nicer in real life than the pictures are showing them as. FYI: There is no denim/cotton strip on the bottom of the Next top, it’s just on the lining and on the sleeve cuffs. The offering from Next felt like you were getting your money’s worth as it was quite a heavy material and presumably won’t mis-shape so easily in the wash. But having said that, maybe a bit thick for spring weather? I’m undecided whether I’ll pick up either of these as, like I said, I think I might have reached my stripe quota. Having said that though, I can always be tempted. 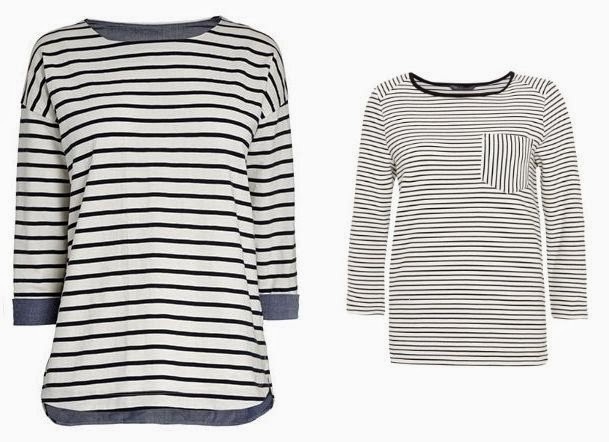 Has anyone else spotted contenders for the perfect striped top? So here's what I've been up to this week according to Instagram. And apparently it involved a lot of eating and drinking! 1. I've been so good this year so far with bringing in my lunch from home...up until last week. I was short on time in the evenings and poor planning really does equal poor eating for me. Obviously Pret isn't a major sin, but my bank balance is much healthier without it! 2. I went to a Starbucks drive-through for the first time. This one has actually been there for a while but I've never felt the need before. I did feel very blogger-esque haha. Peppermint hot chocolate, in case you're wondering. 3. Standard post-work chill phase. Leopard print PJs and a top knot. 5. I think I absorbed a mega dose of London germs on Wednesday and woke up on Thursday feeling all full of cold. I don't normally like to take medicines but I just didn't have time to be ill last week so majorly dosed up. Although I'm not sure how much it really helped. The germs have overstayed their welcome and can definitely go now. 6. Fat Friday lunch. Whoops. Friday is always our 'let's go buy something nice' lunch day but McDonalds is not the norm. My managers had it though and ate it around my desk, and after that I had the thought of french fries in my head. 7. I got this shirt in the New Look sales after Christmas and hadn't worn it until last week for some reason. I love the fit though and wish I'd bought it in another colour. 8. My sister came for a fleeting visit on Friday-Saturday which was lovely. We chatted wedding plans and helped her pick her dress, then on Saturday morning headed out for brunch. How cute are the tea sets they serve? 9. Highlight of the week for sure. Mark bought me tickets to see Taylor Swift at the O2 back in November for my birthday and it actually feels like the date came around pretty quickly. All I can say was the show was amazing. Obviously I'm a big fan, but aside from that the staging and everything was fantastic and she was really good live. What i hadn't anticipated was the crazy level of fan-dom that she attracts though. Wow. (I may have bought myself a comfy T Swift jumper for house wear...shhh). What did you get you get up to?